My dad and I rolled out of our city park campground in Tyndall, SD at 6:30 pm to a subtly rising sun. We rode north into the wind and it was hard work but we were in good spirits. To the west, the sky was dark and cloudy. To the east, the sky was orange and gray, with a nearby pocket of rain. 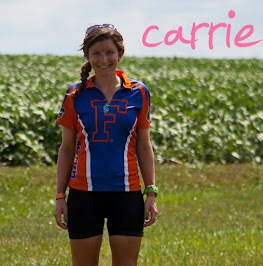 The view of the sunrise over the cornfield was perfect and I had to stop only a few miles in for some photos. At mile 6, we turned east onto Highway 46 and sped along with the wind at our backs. Rain started to fall and we knew that the dark, cloudy skies to the west were moving in our direction. At dinner the night before, we'd talked about the drought and how it was bittersweet because at least it meant we'd barely been rained on. I said that I'd rather be showered with rain any day if it was an alternative to riding under the beating sun in 100+ degrees. Mother earth had listed to me because here was the rain! We turned on our flashing lights to stay visible and stopped for a taste of the blueberry scone and apple fritter that my mom had picked up in Tyndall's bakery. 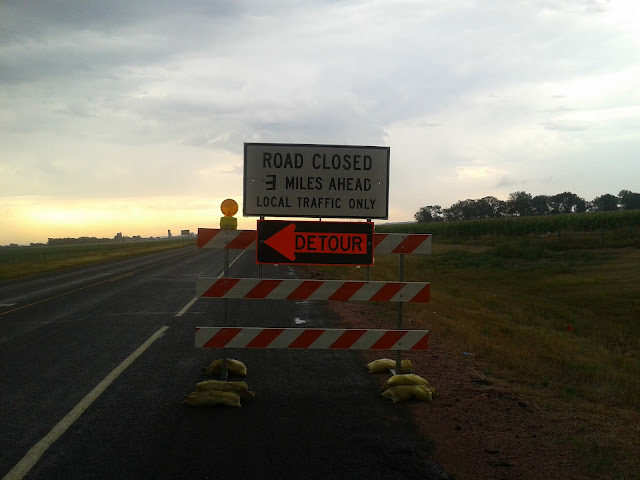 At mile 12, we were re-routed by detour signs on Hwy 46. We turned left, wondering how many miles this was going to add to our day. The rain started to feel sharp and forceful and I wondered if it would, or had, turned to hail. My dad said this wasn't quite hail but we should be mindful to stop if it got much worse. While it seems like a crappy situation to be in, stuck on a bike in the foggy rain, I could not have been happier. I am a little embarrassed to admit that the song in my brain at the moment was the country song "it's a great day to be alive". I declared that this was the best day of riding since Custer State Park and it was completely true. I actually started to feel a little cold and, when it got the slightest bit uncomfortable, I tried to remind myself how much I'd hated the heat. I am very much a "grass is greener" type of person when it comes to weather which I need to work on. I did my best to appreciate the chill. Around mile 25, my parents switched and I made my mom take pictures of my dad and I soaked in water and speckled with dirt. The rain had mostly ceased but we were still drenched. The pictures don't do it much justice though. My mom rode the remaining miles and my dad did some extra riding by driving ahead, parking the car, riding back to meet us, and then riding with us to the car to do it all over again. We stopped in Irene, SD to eat a picnic lunch and bought lemonade from two local entrepreneurs. In Centerville, we were staying with a man named Harry Smith. He is a city councilman and the town's web designer so he received my mom's e-mail a few months ago inquiring about camping in the town. He offered us his yard and, when we got there, he offered us his basement. After swimming in the public pool and checking out the library, we returned to his house for burgers and corn. He is a New Jersey native who moved to California and Florida before settling, five years ago, in Centerville, SD. He is a computer engineer turned murder mystery novel writer and, in true mid-western fashion, he was as nice as can be and opened his air-conditioned home to us for the night.